Hello there, today I have my last card to share as part of guesting for Sweet Stamp Shop. 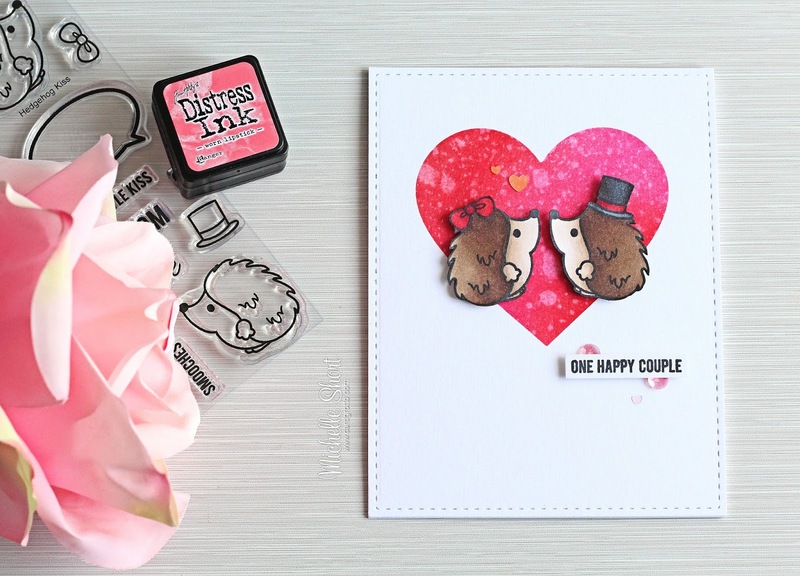 Today I am using the adorable Hedgehog Kiss stamp set. It is so sweet! I started off by die cutting a piece of watercolour cardstock and a piece of mask paper using the largest of the dies from the WPlus9 Gift Card Layers Die set. I then cut a heart from the mask piece to create an aperture. The mask piece was added on top of the watercolour cardstock piece and then I blended over shades of red and pink Distress Ink on the heart. I spritzed this with water to give some added detail. I took the hedgehogs from the set and stamped these with black ink. I added the top hat and bow to them using masking. They were coloured using Copic Markers and then fussy cut out. 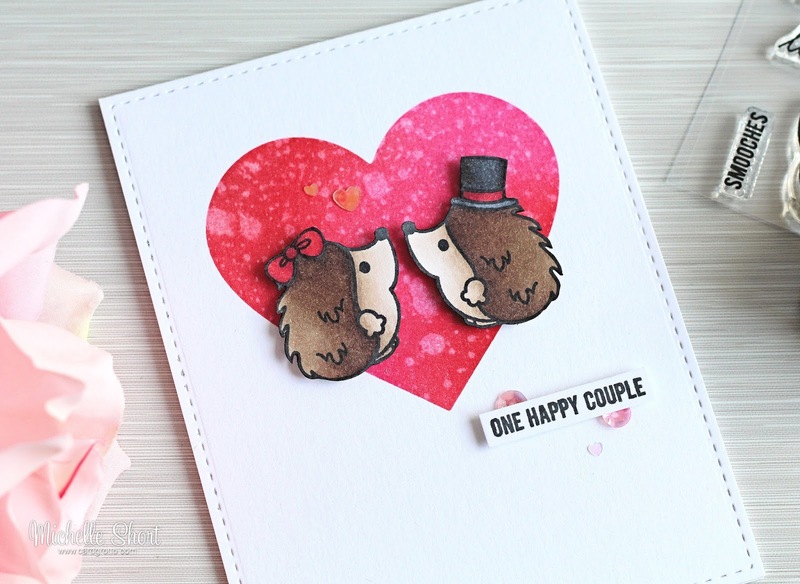 I added the heart piece to a white A2 card base with ATG and then the hedgehogs to the heart with foam tape. The sentiment, from the Just the Basics set was stamped and cut out and added with more foam tape. To finish, I added a few sequins and heart confetti. Here are the links to what I have used on the card. Please click on the picture or wording to be taken to where I purchased it. Affiliate links are used on some products. This means that if you make a purchase after clicking on my link, I receive a small commission with no extra cost to you. I truly appreciate your support when using these links. Please click on the letters below the product to shop at your favourite store - Simon Says Stamp (SSS), Hero Arts (HA), Seven Hills Crafts (SHC) Amazon (AZ) etc. Products marked with an asterisk (*) were kindly sent to me to use. COPIC MARKERS - Hedgehogs: E49, E47, E44, E43, E42, E41. Top hat: C10, C8, C6, R89, R37, R27. Bow: R89, R37, R27, R14. I thought this card would work well for a wedding or an anniversary. I love making cards that can be used for a couple occasions :) A big thank you goes to Sweet Stamp Shop for having me guest this month. For more inspiration on using their stamps, please head over to their blog. Thanks so much for visiting me today. I hope you have a great day! Really cute, I love the ink blended background.